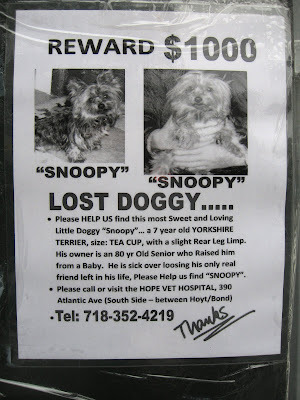 These flyers posted all over Downtown Brooklyn tell a tale of woe: a sweet and loving little teacup-sized Yorkshire Terrier named 'Snoopy," with a slight rear leg limp, was reportedly abducted from his heartbroken 80-year-old owner on Tuesday at 4 p.m. The owner is "sick over losing his only real friend left in his life." A $1000 reward is offered. 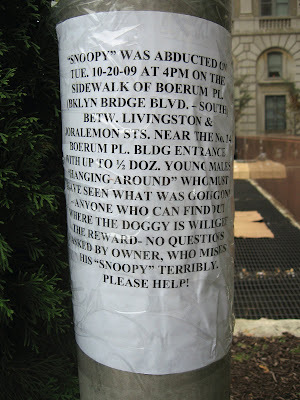 A second set of flyers gives more details: Snoopy was abducted from the sidewalk of Boerum Place between Livingston and Joralemon Streets. A half a dozen young males were "hanging around" who must have seen the deed, the flyer says. Anyone who can find out where the dog is will get the reward -- no questions asked. Call the Hope Vet Hospital, 390 Atlantic Ave. (south side between Hoyt and Bond) at 718-352-4219 if you have any information. 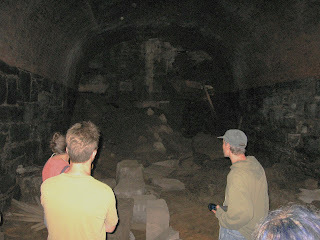 Now (just in time for Halloween) an article in the Brooklyn Eagle reveals what may be evidence that the tunnel is haunted. Fact: There have been sightings of a hovering green orb with a “sickish color." Fact: Sleuths from both the Long Island Oddities and Paranormal Society and the Long Island Society for Paranormal Research have taken their voice recorders, electromagnetic field detectors and cameras into the tunnel, hoping to capture concrete proof of the haunting. Fact: Numerous souls have met an unpleasant demise in the lonely tunnel deep below Atlantic Ave., including one body that was chopped up and embedded in the tunnel wall. Fact: Huge spikes on electromagnetic field detectors have been recorded in the tunnel. Fact: We still don't know What's Behind the Wall . . .
And there's more. Read all of the hair-raising details at the Brooklyn Eagle. In what was billed "Day of Outrage 2," the Transit Workers Union Local 100 "Took It to the Bridge" yesterday afternoon -- and all the way to City Hall. In spite of the drizzle, hundreds gathered in Downtown Brooklyn at Cadman Plaza West and Montague Street, heard fiery speeches, then marched along Cadman Plaza, over the Brooklyn Bridge and into Manhattan. 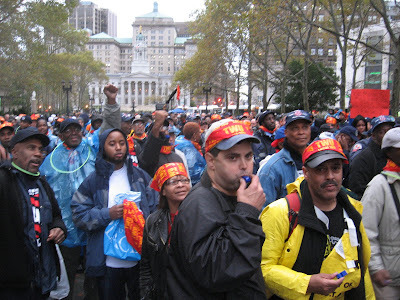 Union members blame Mayor Bloomberg, who has spoken out aggressively against the raises, according to the NY Times. 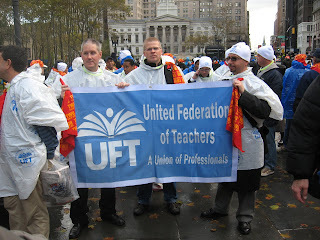 Getting a little support from the UFT. Starting 10/29/09-10/30/09 from 7AM-7PM expect low flying helicopters in and around Manhattan for the filming of a movie. Locations will be Midtown, Wall Street, George Washington Bridge, Manhattan Bridge and the Verrazano Bridge. Could this film be "The Other Guys" -- the Will Ferrell and Mark Wahlberg buddy-cop comedy? (Also starring Samuel L. Jackson and Dwayne “The Rock” Johnson) The Other Guys recently filmed helicopter scenes in the city on October 8, and On Location Vacations puts them in New York City today. Whether or not it's The Other Guys, here's an amazing clip of a stunt from the film taken on the streets of New York the other day. This clip comes from Colider.com (who got it from badtaste.it). 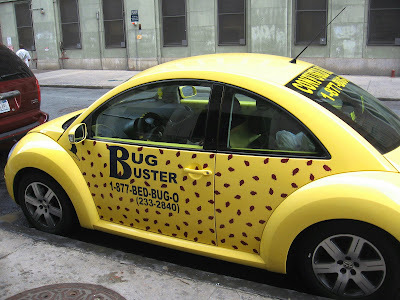 There's nothing like a sweet little yellow VW painted with hundreds of fat red bed bugs. 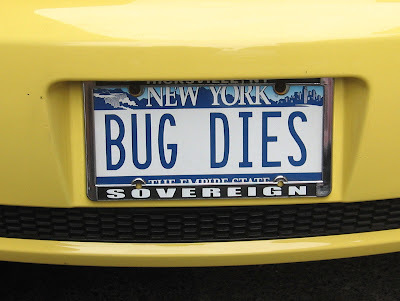 This particular car, photographed in Downtown Brooklyn, states on its license plate: "BUG DIES." Can't make it any clearer. 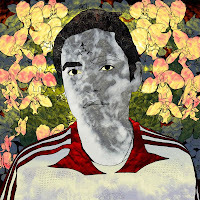 - Patrick May presents “Portrait Photo Considered Harmful” at Open Source Gallery until Nov. 3. He "remixes the familial portrait and vacation photography of social networking into mythical icons." 255 17th street between 5th and 6th Ave (street level) in South Slope, Brooklyn. - In The Brooklyn Ink, there's a story by Alessia Pirolo called "The Bushwick Boat" -- "One of the best-kept secrets in Bushwick is a former ferry boat from the Massachusetts island of Martha’s Vineyard. It serves as a home for three men who were living down to earth existences on dry land until the boat dramatically changed their lives." 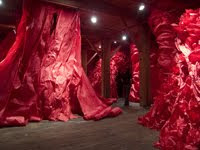 - 303GRAND in Williamsburg is showing an installation by The Next Generation Design Leader Grant winner, Dongyun Lee. “Eternal Flow” opens on October 28th from 7 - 10 p.m. and runs through November 2nd at 303GRAND, located at 303 Grand St. in Williamsburg, Brooklyn. - Live in Boerum Hill? “Jaws,” The Hoyt Street Association’s professional chipper/shredder machine is available to shred your material on Shredding Days. Bring your leaves, branches, etc. Saturday, Nov. 7th 11 a.m. - 1 p.m. Hoyt Street Garden; and Saturday Nov. 21st 11 a.m. -1 p.m. at the David Foulke Garden. 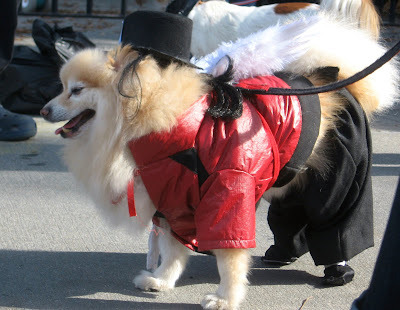 Dozens of dogs dressed in their finest Halloween costumes Sunday afternoon and promenaded down the Brooklyn Heights Promenade for the 7th Annual Brooklyn Howl-o-Ween Doggie Costume Parade and contest. Tom Vasquez, of Perfect Paws, was a howl. 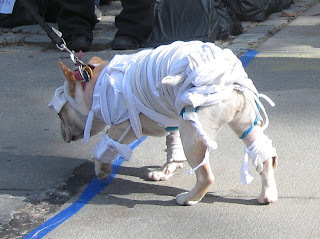 Here's Mummy dog. The poor thing. 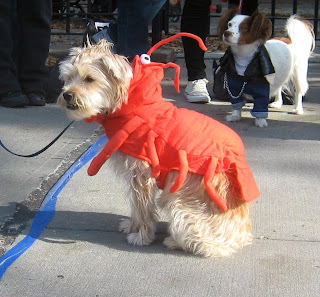 Above is Rock Lobster dog, with some kind of dude dog in the background. This is submarine sandwich dog, though it's kind of hard to see all the lettuce and tomato from this angle. 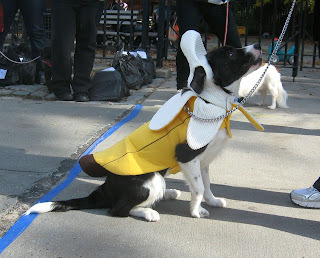 Above is a banana-thingy dog. 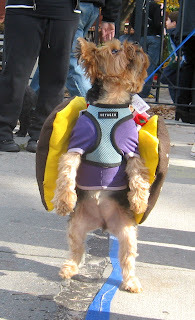 This high-spirited event is a charity fundraiser, organized by Perfect Paws and Friends of Hillside Dog Park. 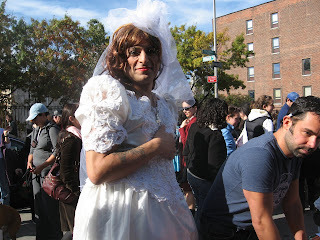 More Halloween events can be found at the Brooklyn Eagle web site. Best group or duo: Mathew Parker and Martina Sabacka with their Spinone, Guisseppe as Pilot, Flight Attendant and Airplane. The list of all winners can be found here. Hungry? Want to try some KFC grilled chicken? Today's your lucky day -- KFC is giving away a free piece of chicken to each customer all day today, Monday, Oct. 26, 2009. Last time they did this Oprah announced the promo on her show and KFCs across the country were overwhelmed by thousands of customers. According to Yahoo News, KFC promises they'll be ready for the crowds this time. No coupon necessary -- just show up hungry. Here's some nutritional information about the chicken. 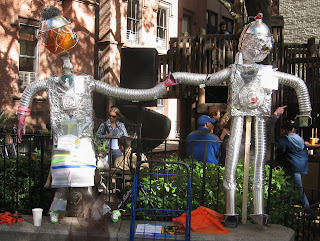 The annual Packer Pumpkin Patch was a big hit in Brooklyn Heights Sunday, with its two(!) haunted houses, carnival rides and games, arts & crafts, food, etc. 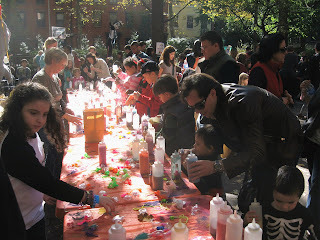 Hundreds of kids, moms, dads and grandparents enjoyed the activities and the beautiful sunny day. The school's interior was transformed into a spooky playhouse. 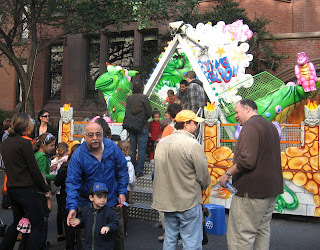 Joralemon Street was closed from Clinton to Court to accommodate the giant inflatable bouncy rides. Even these robots had a great time. The Brooklyn Portfolio, the Brooklyn Fund put together by McBrooklyn and McBrooklyn readers, became a reality Friday, October 23, with the purchase of 10 shares of each Brooklyn-related stock or ADR in the fund. The fund (not public but anyone can copy these purchases if they like) now holds 80 shares, 10 each of the eight stocks listed below. As we explained in our original post about The Brooklyn Portfolio, every once in a while we'll review how the portfolio is doing. (We might even create a fancy bar chart.) If the portfolio is up, that will be good news for Brooklyn. If it's down we'll cry and pound the table. The Brooklyn Portfolio includes shares in companies that have a strong Brooklyn presence, started in Brooklyn or have some other significant connection to Brooklyn. Several companies were recommended by McBrooklyn readers. (See post one and post two.) The fund doesn't include every business founded in or related to Brooklyn -- just the companies that seem to be sound and offer opportunities for growth and/or income. These companies are subject to change, but our aim is to hold onto them as long as is prudent. Yield: We notice that the yield is rather generous on many of the stocks in The Brooklyn Portfolio. [NOTE: These are the yields reported by Google Finance. We've noticed that sometimes yields vary depending on who reports them] National Grid, for example, reportedly yields 7.23 (as of Friday, Oct. 23). Pfizer yields 3.71. Dime yields 4.83. Bristol Meyers Squibb yields 5.58. Novartis yields 3.30; Brooklyn Federal Savings Bank yields 3.31. Corning, however, yields less -- 1.28 -- and Nathan's pays no dividends at all -- but they do make good hot dogs. So there you have it. We sincerely hope the Brooklyn Portfolio makes us all rich, but even if it doesn't it will be interesting to see how this fund performs compared to other funds based around equally flimsy principles. 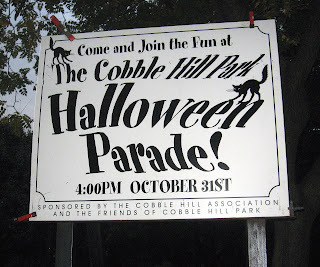 For those with little children, Cobble Hill Park will be ground zero at 4 p.m. Halloween afternoon. The costume parade will set off behind the Jah Pan Steel Drum Band, then the older kids will trick-or-treat around the neighborhood. The Brooklyn Eagle has extensive Halloween listings here. - Novartis (NVS), which makes health care products including pharmaceuticals (they took over Brooklyn's Ex-Lax), was selling for $52.20 yesterday, with a PE=15.76 and a yield of 3.28*. - Brooklyn Federal Savings Bank (BFSB), a bank headquartered in Brooklyn. They're down about 10% year to date, have a PE= 28.39, and yield 3.16%. It was selling for $12.64 yesterday. So here we have our Brooklyn Portfolio, subject to change depending on which way the wind blows. Three of the eight stocks are in the health/pharma area, and two are banks. Then we have an energy company, an industrial/tech company, and a restaurant. In a couple of days we'll start producing charts and all kinds of lists of official looking numbers! A reader also mentioned Forest City Enterprises (FCA.A), parent compant to our own F.C. (Bruce) Ratner. We don't feel confident yet about commercial real estate, and Forest City seems to have a little cash flow issue. So we'll wait on this one. UPDATE: The Brooklyn Portfolio is funded! *Yields as reported by Google Finance. May vary. Moms and nannies with their kids, yoga stretchers, gymnastic tumblers, homework-doers and anybody who could find an excuse to go outside today gathered at Cadman Plaza Park in Brooklyn Heights / Downtown Brooklyn. What a day! Isn't this stock market just crazy? 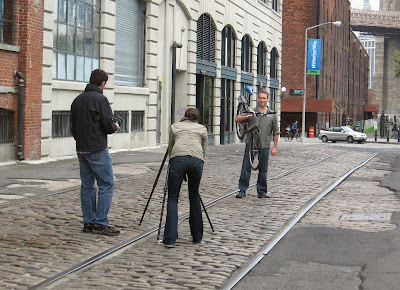 We at McBrooklyn decided we wanted in -- so we're setting up The Brooklyn Portfolio. The Brooklyn Portfolio includes shares in companies that have a strong Brooklyn presence, started in Brooklyn or have some other significant connection to Brooklyn. We'll carefully screen each company (that might even include looking them up somewhere). We can add a stock (for example, if someone points out a Brooklyn-based company that we didn't know about, and it seems like a good buy), or drop a stock (for example, if it's sinking like a rock thrown into the waters off Coney Island). Some famous companies which began in Brooklyn (like Cumberland Packing Co., makers of Sweet'N Low) are privately owned so we can't buy their stock. But others, like the drug company Pfizer, producers of Viagra, are fair game. Every once in a while we'll check how the portfolio is doing. (We might even create a fancy bar chart.) If the portfolio is up, that will be good news for Brooklyn. If it's down we'll cry and pound the table. Dime Community Bancshares, Inc.(DCOM) -- The parent company of The Dime Savings Bank of Williamsburgh. It was selling for $11.59 yesterday, and is down almost 13% year to date. PE= 16.33, and it yields 4.83%. Nathan's Famous (NATH) -- Started at their famous Coney Island hotdog outlet, now they own restaurants and sell doggies nationwide. It was selling for 14.46 yesterday. It's up 14% year to date. PE=16.96; no yield. 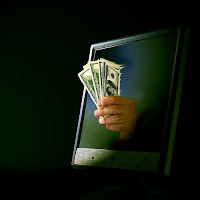 That gives us exposure to pharma, financials, industrials, restaurants, and energy. Any other quality investments we've forgotten about? UPDATE: Suggestions so far include Berkshire Hathaway, which bought Brooklyn's Benjamin Moore paint company; Novartis, which took over Brooklyn's Ex-Lax (which, as our commenter pointed out, has a history on Atlantic Ave. like Benjamin Moore); and Brooklyn Federal Savings Bank. We like all of these companies, but we agree with commenter 1 that Berkshire Hathaway "is a bit rich for our blood." At almost $100,000 a share for the class A shares and $3,292 for the B shares, Berkshire would overwhelm our other holdings. UPDATE 2: The Brooklyn Portfolio takes shape here. New York City has set up a web portal where you can get information about where to get a flu shot, along with forms you can download so your child can get vaccinated for free. If you think you have the flu and don't have a doctor (or can't afford one) the web site provides a widget that tells you where to find a free clinic near you. The park may as yet be just mounds of concrete and jumbled piles of rock, but these trees, lined up on a couple of inches of dirt, are turning glorious fall colors. On the Brooklyn Heights waterfront. 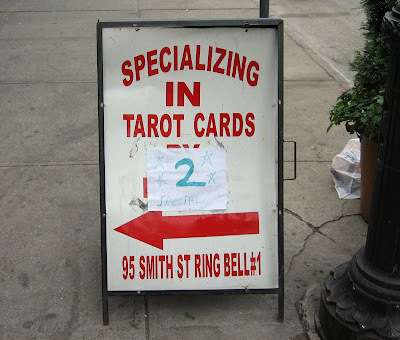 Even the Tarot Card reader at 95 Smith Street in Boerum Hill, Brooklyn, feels the pinch of the recession. The $5 Special Reading has been cut to two bucks. 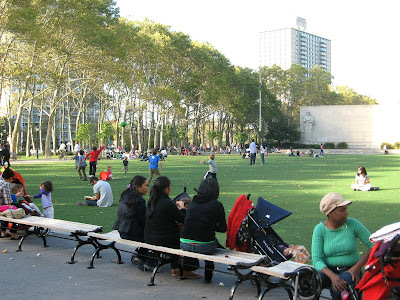 When a fluctuation in Earth's gravitational field caused the benches in Cadman Plaza Park to start floating off the other day, these Brooklyn Heights park-goers jumped into action. 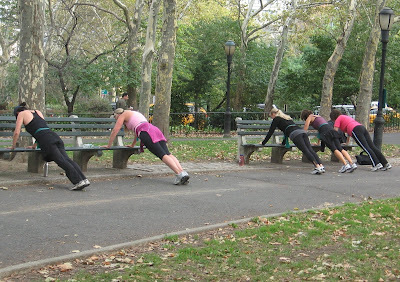 It took their combined effort, but the benches were successfully pinned down till the fluctuation passed. A small water fountain drifted off, but no other park furniture was lost. Brooklyn by Bike is combining the love of bicycles with the love of street food for a tour called Gears and Grub. They're teaming up with VendrTV in search of the best street food in Brooklyn. The ride starts on Sunday 10/18 at 11 a.m. from the Grand Army Plaza Arch and ends in Williamsburg. This is an all day event that will be streaming live on Twitter, so you can join in along the way. Tentative stops along the way include Chinese food in Sunset Park; the Red Hook (Latin) vendors; Schnitzel and Things and Green Monster in Dumbo; and Swedish meatballs and drinks at Eurotrash in Williamsburg. More at Brooklyn by Bike. Couldn't help but admire the positive attitude of Bike Guy, getting his picture taken on the Belgium Block streets of Dumbo in Brooklyn. These workers are ripping out the old brick sidewalks on Fulton Street in Downtown Brooklyn and replacing them with standard cement. The work is part of the ongoing $15 million Fulton Streetscape Project which includes 67 new trees, new benches, bus shelters, bicycle racks, and streetlights and the creation of a public square outside the domed Dime Savings Bank building. Construction started in May 2009 and is expected to be completed in the second quarter of 2011, according to the Brooklyn Eagle. 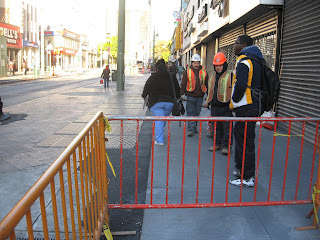 - Fulton Street, Downtown Brooklyn: Will Its Glory Days Return? A Barnes & Noble e-Reader In Your Christmas Stocking? See photos of what may be the (secret) new Barnes & Noble e-reader on Gizmodo. It could be ready by Christmas, according to the Wall Street Journal. Barnes & Noble refused to comment, according to CNET. Meanwhile, Simon & Schuster is working with a multimedia partner to release four “vooks,” which intersperse videos throughout electronic text, according to the New York Times. 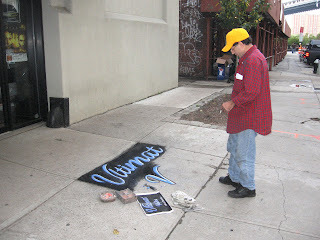 This artist was chalking out the words "Ultimate Vodka" in front of Galapagos in Dumbo last Friday. We found out later an Ultimate Vodka event was about to take place there as part of the New York City Food and Wine Festival held all Columbus Day weekend. You can see photos from the Bash on Dumbo NYC and at the Brooklyn Paper. Here's another viewpoint: What went on there was called "a spectacle of excess" by Josh Ozersky (a judge at the Bash), writing for Vanity Fair. The winning burger was fine, he writes, but could have won without "its hideous toppings, its cynical marketing ploys, and the chef's ridiculous fedora." Those who didn't travel straight back to Manhattan afterward on the Delta Airlines Burger Bus (complete with flight attendants and snacks) may have drifted over to Galapagos for a glittering night out and a bit of vodka. 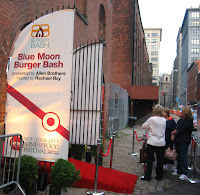 I saw you as you walked into the Rachael Ray ultimate vodka event/burger bash this past Friday in Brooklyn. You were wearing a white thermal and jeans, you are tall with dark hair. We made eye contact and I was going to come over to say hello. But then you suddenly ran out. I thought you were going to come back but you never did. I felt we had a momentary connection and would like to get to know you. Please email if you felt the same way. Girl, it's a crazy city. You eat your burgers, you drink your vodka, and just when you meet a guy, he hops on the Burger Bus -- and he's gone. - Win tickets to an Oktoberfest pig roast at Brokelyn. The 2009 Film Racing Tour will be coming to Brooklyn on this Friday, Oct. 16, 2009. Filmmakers will be challenged to create an original short film in just 24 hours, from 10 p.m.on Friday, October 16 to 10 p.m. on Saturday, October 17. All of the completed films will premiere at the Brooklyn Heights Cinema, 70 Henry Street, a few days later. The teams will be competing for over thousands of dollars in cash and prizes against filmmakers from 20 other cities. Here's last year's Brooklyn winner, "Plane Face" by Yellow Line Pictures. 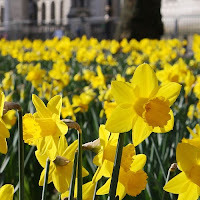 Sunday, October 18th, is Daffodil Day in Kensington, Brooklyn. Join your neighbors and plant daffodil bulbs on Church Avenue and its side streets. In the spring, watch the flowers that you planted bloom! Wear clothing and shoes that you don't mind getting some dirt on. If you can, bring a hand cultivator, trowel, bulb borer, anything else that's useful for digging and planting and some for your neighbor, too. Meet at 9 a.m. in front of Astoria Federal Savings, at the corner of Church and McDonald avenues. Connie, the owner of Connie's Cafe (corner of Church Avenue and E. 5th Street), has graciously agreed to donate coffee and muffins for the volunteers. This neighborhood event is sponsored by KARMABrooklyn (Kensington Area Resident/Merchant Alliance) and WKAG (West Kensington Action Group). 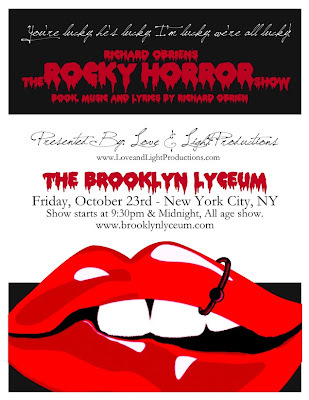 C'mon you sweet transvestites, bring your black knit nurse corsets and heavy eyeliner down to the Lyceum to relive the classic stage musical of the Rocky Horror Show. Love and Light Productions brings the full production to life with a one-night stop at the Brooklyn Lyceum on their East Coast tour. Director Alicia Starr and her talented full cast come ready to get you primed for the Halloween week ahead. More info about the cast and production at loveandlightproductions.com. The Brooklyn Lyceum, known formerly as NYC Public Bath No. 7, is a performing arts and cultural center in Park Slope. 227 4th Avenue in Park Slope, right atop the R train station at Union Street. To get in the mood, here's a snippet of Time Warp from 20th Century Fox's Rocky Horror Picture Show. Video and music copyrights of 20th Century Fox and the respective parties. The fate of the public option will be decided in the next few weeks—and Sen. Schumer will need to fight like hell to win real health care reform. Let's thank him for his strong support and show him we've got his back heading into these final, crucial weeks. Come to Brooklyn Borough Hall tomorrow (Wed., Oct. 14) at noon for a "We're Counting On You" rally. We'll show Sen. Schumer that we need him to keep fighting for a strong public option all the way to the finish. - The Prospect Park Alliance is seeking a Boat Captain to pilot the electric boat Independence. $20/hr. ProspectPark They are also looking for someone to man the front desk at the Prospect Park Tennis Center. $10 an hour. Here. - The Brooklyn Bridge Park Conservancy seeks an energetic, politically skilled, goal-oriented executive director. BBPC They are also looking for a Public Programming Director. Here. OK so they weren't real, but it was a pretty good gimmick. These pretend protesters were employed by metroPCS the other day to tout their wireless plan. Unlimited texting. OMG. No freakin' way. The Seventh Annual openhousenewyork Weekend is Oct. 10 & 11. The goal is to experience the city’s architecture and design in all five boroughs, free of charge. Brooklyn highlights include open studios at the Brooklyn Navy Yard, a BellTel Lofts tour, Coney Island Talking Sidewalk tour, the Green-Wood Cemetery tour, 93 Nevins, a Prospect Park walk, a Writers and Religion in Old Brooklyn Heights tour, the Atlantic Ave. Tunnel tour, a Brooklyn Bridge Park hardhat tour, the Barzel Ironworks, and countless churches, museums, libraries, societies, converted performance spaces, carriage houses and the oldest home in New York City. There are also plenty of educational and entertaining events for kids, such as the Weeksville Scavenger Hunt. 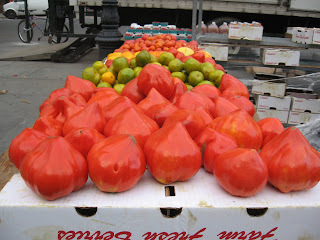 Is it just us, or are these tomatoes unusually pointy? They were for sale at the farmer's market at Brooklyn Borough Hall in Downtown Brooklyn / Brooklyn Heights. 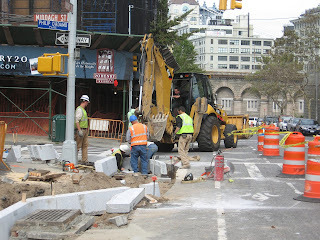 Traffic-calming "neckdowns" or "bulbouts" are under construction at Henry Street intersections from Cadman Plaza West (Old Fulton Street) to Atlantic Avenue in Brooklyn Heights. The work is part of the Department of Transportation’s Downtown Brooklyn Traffic Calming Project. The sidewalk protrusions (the one shown above at Henry and Middagh Street is a granite curb) will make it easier for pedestrians to cross Henry street at the intersections and may slow traffic as well. This graphic from DOT's report shows, in addition, textured (or high visibility) crosswalks and a bike box at Clark Street and Henry, though these parts of the plan may have changed since it was first set to paper in 2004. 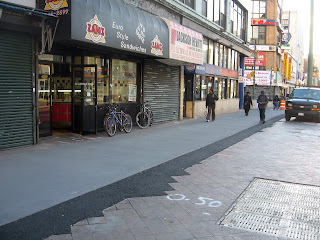 More on the Henry Street improvements at the Brooklyn Eagle; here's the Henry Street segment of the 2004 DOT report. Traffic calming improvements are popping up all over Brooklyn. Streetsblog discusses the very large sidewalk extension at the northwest corner of Smith and Bergen. Brownstoner has another photo of this intersection that shows the extension more clearly. Community Board 6 created a summary of traffic calming work being done this month. UPDATE: Check out Jonathan Ross' comment below to find out what one artist is planning for all those "neckdowns" and "bulbouts" popping up all over the neighborhood. 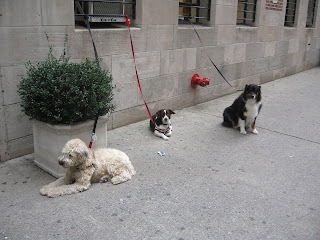 These three dogs, each in their own world, sit outside a school in Downtown Brooklyn waiting for their masters. - Researchers found that airplane pilots who ate the fattiest foods such as butter or gravy had the quickest response times in mental tests and made fewer mistakes when flying in tricky cloud conditions. BOFFO, an arts organization that uses temporary locations, is presenting their first exhibition, Objective Affection, through October 30 at One Brooklyn Bridge Park (the condominium located at 360 Furman Street below the Brooklyn Heights Promenade). The exhibition and consignment shop (which holds objects important to the creation of the art) is open Thursdays - Sundays from 11 am - 7 pm, or by appointment on Tuesdays and Wednesdays, and is free to the public. According to a release from BOFFO, Objective Affection "explores the influence and allure of tangible entities in contemporary culture." The exhibition showcases the work of over 100 emergent and established artists and designers including Terence Koh, Caraballo-Farman, Jason Tomme, Efecum Kutuk, Tom Fruin, Josh Owen, Erin Fetherston, as well as designers from Areaware and Kikkerland. Release: "Through a wide variety of multi-disciplinary media including graphic design, visual art, performance, fashion, video, architecture and industrial design, the exhibition juxtaposes a mass of independent voices from artists of all ages, backgrounds and interests as a representation of the our universal similarities and individualities that are established through objects." The gallery space at One Brooklyn Bridge Park is 14,000 – square - feet. BOFFO is the first organization to use this space, which has been donated to the arts program by building’s developer RAL Companies & Affiliates, LLC. Will It Rain On the Cranberry Street Fair?